Lots of parking in mall. Moonshine Monday - Every Monday you are welcome to bring in your own bottle of wine (with no corkage fee charged) to enjoy with your dinner. A $20 per bottle corkage fee is levied per bottle of wine you bring during the remainder of the week. Tipsy Tuesday - All wine bottles priced 1/2 off! Winesday Wednesday - Every Wednesday, receive a 9 oz. glass of your favourite red or white wine served by the glass from our wine list and pay the price of a 6 oz. glass. Catering and Events - Let us cater your next event, big or small at your home, your office or any venue of your choice. With a separate, private dining space inside our restaurant, we can host parties of 45 – 50 people or 75 – 80 people when you reserve the entire restaurant. Let us take care of you with UNLIMITED MENU CHOICES. We can cater to any event at your house, place of business or other venue. A menu can be styled to meet your tastes and budget. We offer a private dining area for 20 up to 50 people at tables of 6 to 8 patrons each. Depending on the party size we can offer a reception area with cocktails and appetizers prior to dinner. Special menus can be created for your function. Involtini is the home of Northern Italian Inspired Cuisine - "Built from the Sauce Up". Only the freshest herbs and market vegetables reach our kitchen along with locally sourced quality seafood, meats and cheeses. Your dining experience will be enhanced with unique wines provided by JWebb Wine Merchant. All dinners are prepared from scratch so may take a little longer to make to guarantee a mouth watering experience. For those patrons who require gluten free items, we are pleased to inform that 95% of our menu can be made without gluten. Join us for dinner tonight. A warm European ambiance awaits you. Herbed parmesan panko crumb crusted asparagus spears baked not fried served with lemon dill crème fraiche. Thin sliced mushrooms in a marsala garlic cream sauce served with toast points. Three jumbo prawns sautéed with thyme roasted cherry tomatoes in a smirnoff vodka garlic cream sauce. Baked brie wheel topped with a caramelized onion maple glaze served with toast points. Oven roasted peppers and olives served with marinated artichokes, portabella mushrooms and assorted cheeses with italian smoked meats. Roma tomato marinated with basil, garlic and peppers tossed with balsamic vinegar and extra virgin olive oil served with toast points. Calamari, flattened and tenderized, dusted with herbed corn flour, lightly sautéed and served with choice of warm olive and diced tomato white wine sauce or yogurt tzatziki. Mussels, jumbo prawn and scallops in a spicy tomato vegetable broth with a touch of cream. Add to any salad: jumbo prawns (3) or chicken breast $8. Fresh pear and spinach leaves, toasted pine nuts and proscuito topped with parmesan and fig balsamic reduction. Fresh sliced roma tomatoes layered with fiore di latte bocconcini and fresh basil drizzled with balsamic vinegar and extra virgin olive oil on spinach leaves. Romaine lettuce tossed with our own eggless caesar dressing and house made croutons topped with a crisped pancetta round. Romaine lettuce, sliced tomato, cucumber, red onion and kalamata olives dressed with lemon and extra virgin olive oil. Roasted beets, spinach leaves and cranberries tossed with maple basil vinaigrette topped with crumbled goat cheese and a candied pecan crusted crisped pancetta round. Pork tenderloin scallopini wrapped around pear slices and brie cheese finished with leek honey sherry butter sauce and a touch of chilies. Zuchinni ribbons wrapped around portabella mushrooms, red pepper spears, bocconcini cheese, lightly breaded and finished with tomato basil sauce and served with saffron tomato risotto. Chicken scaloppini wrapped around jumbo prawns finished with a brandy garlic cream sauce. Beef scaloppini stuffed with roasted portabella mushrooms and blue cheese finished with a peppercorn brandy demi glaze. Veal scallopini stuffed with roasted asparagus and bocconcini wrapped with proscuitto finished with a marsala demi cream sauce. 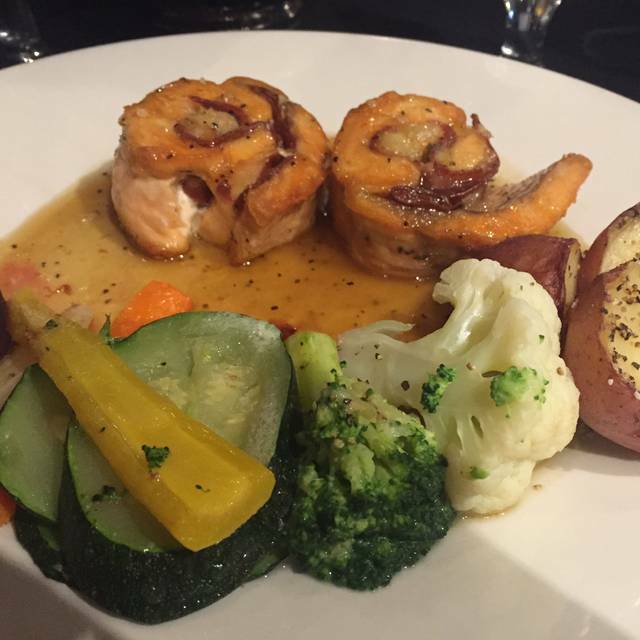 Salmon filet stuffed with prosciutto wrapped smoked jumbo prawn topped with garlic maple butter glaze. Chicken breast, stuffed with brie cheese and gremolata (chopped italian parsley, lemon zest and garlic), crusted with seasoned panko crumbs and served on penne pasta tossed in a lemon brie alfredo cream sauce. Veal scallopini lightly parmesan panko crusted and served with a herb tomato sauce. Veal scallopini sautéed with lobster pieces in a garlic sherry cream sauce. Lamb shank slowly braised in a rich red wine herb tomato sauce served on saffron risotto al milanese and sprinkled with gremolata (chopped italian parsley, lemon zest and garlic). Beef tenderloin, pan roasted and topped with a portabella mushroom port wine demi sauce. (8 oz cut available upon request). Scallops and jumbo prawns sauteed with sundried tomatoes, asparagus and zucchini in a brandy cream sauce with linguine. Salmon filet oven baked and topped with sundried tomatoes in a light pesto cream sauce served on lemon caper risotto. Add to any pasta: jumbo prawns $8, salmon (3oz.filet) $8, chicken breast $8, scallops $8, spicy italian pork meatballs $6, vegetable mix $5. Jumbo prawns, mussels, salmon and scallops sauteed with cherry tomatoes, artichokes, spinach and kalamata olives in a white wine lemon basil butter sauce served over linguini and topped with grated feta cheese. Oven roasted chicken, asparagus and sweet red peppers, ricotta and parmesan cheeses wrapped with fresh pasta, topped with bocconcini and baked with a roasted garlic tomato alfredo cream sauce. Handmade ricotta cheese dumplings served with choice of a herb butter, fresh tomato basil or tomato meat sauce. Jumbo prawns, sundried tomatoes, roasted red sweet peppers sauteed with chilies and garlic in a lemon white wine butter sauce served over angel hair pasta. Paolini's spicy italian pork sausage meatballs tossed with a beef bolognese meat sauce served over linguine. Choose penne, linguine or angel hair pasta and match that with a sauce choice of tomato basil, alfredo cream, rose cream, herb butter olive oil or bolognese meat sauce. Add to any risotto: jumbo prawns $8, salmon (3oz.filet) $8, spicy italian pork meatballs $6, chicken breast $8, vegetable mix $5, scallops $8. Kalamata olives, roasted red peppers, sundried and marinated tomatoes, zucchini, spinach, onion, feta and mascarpone cheese finished with gremolata. Smoked chicken breast pieces sautéed with proscuito, portabella mushrooms, and fresh tomato stirred with arborio rice, mascarpone cheese and spinach. Lobster pieces and scallops with artichokes, capers, sundried tomatoes, fresh dill and goat cheese topped with a 4 oz. Fanned lobster tail, truffle salted and drizzled with lobster butter finished with lemon zest. (Thin crust) fresh roma tomatoes, fresh basil, bocconcini, olive oil. Spicy italian sausage, mushrooms, roasted red peppers. (Thin crust) caramelized pear slices, proscuito, goat or brie cheese, fig balsamic, herb olive oil, parsley. Spinach, green pepper, onion, kalamata olives, tomato, feta cheese. Ham, pepperoni, salami, beef, spicy italian sausage. (Thin crust) asparagus, portabella mushrooms, cherry tomatoes, roasted red peppers, artichokes, kalamata olives, feta and mozza cheese. (Thin crust) fresh roma tomatoes, fresh basil, bocconcini, pesto olive oil. Smoked chicken, fire roasted red peppers, pineapple, jalapeno peppers. Light creamy lemon custard drizzled with a limoncello strawberry coulis and topped with burnt sugar lace. Cinnamon sugared phyllo pastry flower filled with roasted granny smith apple slices warmed in a coconut milk caramel sauce topped with vanilla bean gelato and skor toffee bits. Ask server for today's choices. Light pastry cups filled with vanilla bean gelato and topped with fresh sliced strawberries warmed in a decadent pink peppercorn orange sauce. Flourless dark chocolate brownie topped with a rich chocolate mousse finished with a milk chocolate ganache sauce. Espresso dipped ladyfingers layered with mascarpone mousse topped with cocoa and grated chocolate. Baked toffee and raisin pudding floating in our house made caramel sauce and topped with vanilla bean gelato. Finding a restaurant where the food and service are good and it is quiet enough that you can have a conversation with your friends without shouting is a real pleasure. Involtini is one of these. I went with my friends to celebrate a birthday on a Sunday night. The service was great but not intrusive. I had the salmon involtini. It was delicious! The others had the pizza and salad and enjoyed both. Not a huge wine selection but what we had was just fine. We enjoyed a complimentary dessert to share to honour the birthday. Will definitely return. This was our first time to Involtini. Reading some reviews online tried this neighbourhood gem. We had few disappointments. Being a Tuesday night as we expected it wasn’t busy but that meant our waitress had lots of time to serve us attentively. The food was very good and pricing was reasonable. We will go again. always good, very consistent. Moonshine Monday is the best deal ever. Again, a great little place to come to for excellent food in a beautiful space with a great ambience and perfect for a intimate date or a lovely getogether with friends or family. Gerry and his Team were exceptional! We go pretty regularly and have taken out of town relatives & friends the last two times - they were very impressed. We have been lucky to be served by Gerry, one of the best waiters in Calgary as far as we are concerned. A great dining experience. Quality made from scratch food at a reasonable price. A varied menu with something for all, even the picky ones. Service very efficient. Would highly recommend for all Italian Food Lovers that enjoy the unique and interesting. Great service, nice atmosphere, yummy food. Bit pricey. Had an amazing meal Neil helped us out again and the service and food was amazing. Even with my gluten free requirements they did a great job. It was nice to introduce members of our UK family to Involtini's and why we use it to celebrate special occasions - always memorable! Very good food. Lovely waitress. We enjoyed our meal at Involtini. We selected the lighter menu, which proved to be more than enough for us. The mushroom soup and the salad were both very good. I chose a chicken dish which was very nice, but the sauce could have been a bit thicker for my taste. My wife chose veal that she found most enjoyable. The staff were very informal and this added to the ambience - no false pretensions. Food was excellent but our server seemed inexperienced possibly pressed into service for Valentines Day. Normally i would recommend. I'm guessing that because this was Valentine's Day the service was sub-par. We had a great Valentine's dinner. Service was a 4 only because of how busy they were. Love this place! Cute little restaurant. Prices were a bit high; I would only go back for special occasions. It was a little confusing who our server was as the person who came to our table kept changing. It took a long time for our food to arrive at our table, but we did visit on Valentines, so a longer wait is expected. Valentine's Day! What can I say, very busy. Hardworking staff, personable and friendly. Excellent food! The Duck l'Orange special the best. Varied choices. Great neighborhood venue. You must try! This was our first time at this restaurant. Unfortunately, we did not have the fine dining experience that we anticipated. In honesty, the table service was poor. e.g. When we inquired as to the soup features, the waiter replied, "It's on the menu." It then took 1.5 hrs to get our meal. The hosts seemed to be in a state of confusion, prices reflected fine ding but the food did not, it lacked any significant flavour. The calamari was particularly poor. We send this as constructive feedback, but I'm afraid we won't be. Went on valentine's, restaurant was very busy, food was great, the duck feature my wife had was superb, my chicken dish was wonderful, had great flavors and loved the stuffed prawns in it, service was excellent, considering how busy it was, we were both impressed, it was a bit noisy, but expected with so many people there. I would recommend this restaurant, we will be back. It was very cold in the restaurant. Otherwise it was a great experience. 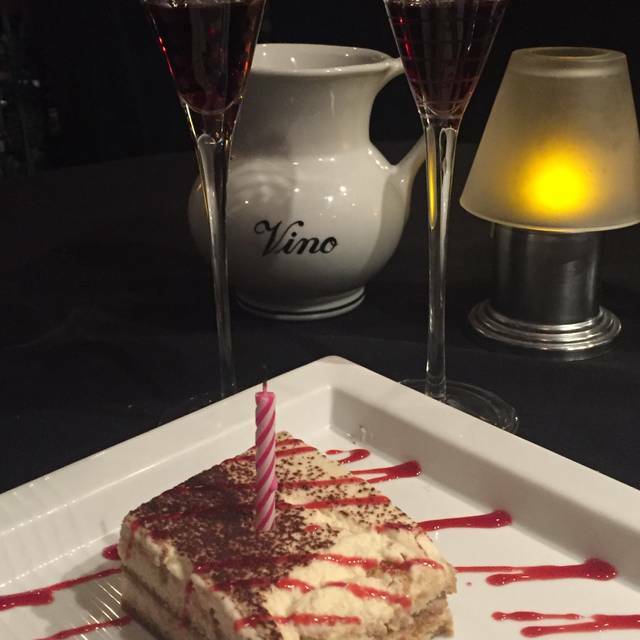 We have always had excellent service with great food! as always, a great place to meet with friends for good conversation (you can hear yourself think!) and great food. Service is excellent, menu varied, food delicious...what more could you want. As expected, excellent service and food. Remains a lovely neighbourhood choice. Food was good, but not great and it was a very long wait. We had a nice time and dinner at the restaurant. They seemed to be a bit understaffed and the dinner was a little slow. When it came time for desert the waiter that seemed to be taking care of the whole restaurant suggested that we not order desert as it didn't sound like we would receive anything for a very long time. That was unfortunate as desert would have been a nice finish to the night. My boyfriend and I in our twenties, and obviously the demographic of this restaurant is an older crowd, probably due to the higher prices. This was okay with us, as we were treating ourselves to a night out. Our server was an older man, who treated each table around us with respect and no sense of urgency/annoyance, we felt we were treated differently. Each time we ordered something, the server ensured to remind us of the price of the dish or drink, as if we couldn’t afford it. He had zero interest in serving us but changed his demeanor when approaching other tables. Beside the service, the restaurant was clean, decorated accordingly, and while the food was moderate, it lacked flavor, and was confusing for the price. I ordered my main for $30 which was a pasta with a garlic sauce and it had3 large prawns, 3 scallops, and 3 mussels. My boyfriend ordered another pasta dish that was also $30, it was smaller than mine and only had 3 shrimp compared to my 9 pieces of seafood, for the exact same price. This was disappointing. Besides the poor service we continued to tip 20% on our over$100 meal. We are both servers, and this experience was not worth our money. Altering your service depending on the age of the customer because you may believe that they would not be able to afford or tip to your wishes, is how you have people spitefully walk out on tabs or not tip at all. We tipped you anyways to prove that we are good enough to eat at your “expensive” restaurant and could afford it just fine. Just ok...everything was over cooked and quite bland. First time in years I had to add salt! Excellent locate on and plenty of parking. Food was absolutely delicious and good portions. The service was friendly and professional. The table location was poor, lots of patron and server traffic. The restaurant was full and noisy, hard for two seniors to hear and converse. Overall it was a pleasant evening. Service was slow...but it was New Years , however waited 45 minutes between appetizer and entre. Halibut was over cooked and swimming in sauce. Birthday dinner for 7 of us. Wanted to find a quality Italian restaurant so decided to try this one based on others reviews. It was not easy to find, the entrance is in a pizza place so we weren’t sure we had the restaurant. Very tiny restaurant and basic decor. The service was good. The food was average and nothing special. It was pleasant but I wouldn’t return. I had booked the reservation for 5 for 7:15 PM and when we arrived we were informed that there was only one item left on the specialty for the evening. The wine we selected from the wine list was also not available. Pretty pricey for smallish portions but tasty nonetheless. We were a party of 4 on a bring your own wine Monday (no corkage) so excellent value. Our waiter apologised right away that due to school exams he couldn't get any of their wait staff in - just him and the restaurant was busy. . He said there would be delays but did keep us informed to status. The ambience is excellent, no music, just hubbub of people chatting. Food as always was great & nice & hot when it came. Our favourite restaurant & also our friends from Signal hill who always want to come to Oakridge to eat there. This is one of my favorite restaurants in Calgary. The food, wine list and service is really excellent. If you haven't Ben you are missing out of a wonderful experience. Relaxed atmosphere and service. Do not expect to dine anď dash. It was a little busy with a big party in the other room and they were short staffed. But th3 food is always good and the time passed quite nicely. Must have been an off night. Group of eight and six of our dishes were very bland.